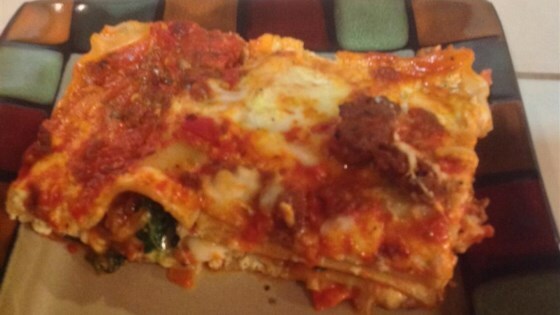 "A lasagna with some time-saving steps that is still yummy." Crumble beef and garlic into a 2-quart microwave-safe bowl. Heat in microwave on high until beef is no longer pink, about 6 minutes. Stir and drain beef. Add spaghetti sauce and water. Combine cottage cheese, eggs, and black pepper in another bowl. Spread about 1/2 cup meat mixture in the bottom of a 9x13-inch baking dish. Arrange half the lasagna noodles over sauce and spread with cottage cheese mixture. Top cottage cheese mixture with half the spinach, half the meat sauce, and half the mozzarella cheese; repeat each layer. Cover baking dish with heavy-duty plastic wrap and heat in microwave on high for 8 minutes. Continue to heat in microwave on medium until noodles are tender and cheese is melted, 30 to 32 minutes, turning dish occasionally. Sprinkle with Parmesan cheese and allow lasagna to rest for 15 minutes before slicing and serving. I cooked in the oven at 350 degrees F (175 degrees C) for an hour because my microwave was too small for a 13x9, and it worked good. Instructions sound like more noodles are needed than called for in the ingredient list. It was ok taste-wise, I'm used to more noodles, meat, and cheese though.